Farnborough bathroom fitters, RoJo carry out work from a simple 'rip out and replace' to installation of complex luxury bathrooms with high pressure pumped body jet showers, Jacuzzi spa baths and steam cabinets. Whether you buy your new bathroom, cloakroom or en-suite from us or elsewhere, we offer a complete installation service. 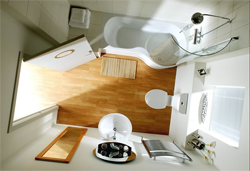 We also specialise in bathrooms for elderly and disabled customers and are a recommended installer of disabled bathroom facilities for Bracknell Forest Council. Our team of bathroom fitters are highly skilled and qualified craftsmen with many years of bathroom installation experience. By using our own fitting team we take great care to turn your dream bathroom into a reality. Our installer will visit your premises to carry out full measurements of the area and space available. They will discuss your requirements and design preferences for your bathroom, in order to create a design that is customised and suited to your individual needs. We can also advise on bathroom furniture, flooring, ceramic tiles, heating, lighting, showers (electric, pumped or gravity fed) and accessories. What's more, this design and quotation service is free and you are under no obligation to buy either during or after our visit. 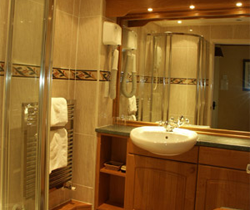 We also supply high quality, well designed bathrooms. 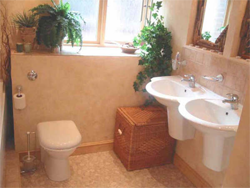 These ranges are only available through the building trade to fully qualified building contractors, and we can offer highly competitive prices on these superb bathrooms. 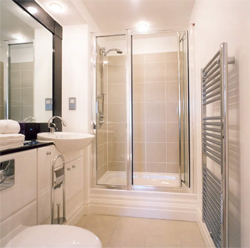 From traditional Victorian through to ultra modern chic, we can supply and/or install your bathroom, cloakroom or en-suite, carrying out all work necessary throughout the project lifecycle including any building work necessary, moving/installing waste and electric points, furniture build and install, accessory fitting (including heated towel rails, radiators, power showers, steam cabinets, spa baths etc), floor and wall tiling and decorating. All you need to do is relax, knowing that with RoJo you can be confident that your entire project will be completed by highly skilled, qualified and experienced craftsmen carrying out the work quickly and efficiently with the minimum disturbance and inconvenience to the highest standards, leaving you with a bathroom to be proud of.